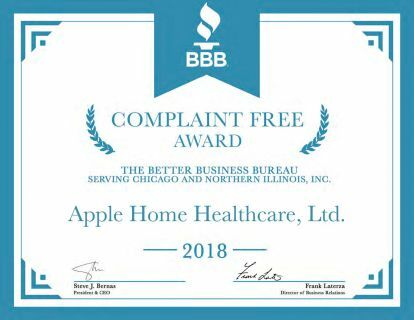 Apple Home Healthcare, Chicago’s number one choice for home healthcare since 1993, is proud to announce that we earned the Better Business Bureau (BBB) of Chicago and Northern Illinois’ Complaint Free Award for 2018. This award recognizes members of the Better Business Bureau that have not received any consumer complaints in the past year. Our “A+” rating combined with the Complaint Free Award from the BBB shows we are dedicated to patient satisfaction and strive to provide the best possible care to our patients. As with all businesses that are accredited by the BBB, Apple Home Healthcare (http://www.applehomehealthcare.com/) has committed to the BBB Code of Business Practices. The Code is a comprehensive set of policies, procedures and best practices on how businesses treat consumers. These standards call for building trust, embodying integrity, advertising honestly and being truthful. Apple Home Healthcare provides healthcare services in 11 counties in the Chicagoland area. Give Apple a call today at (773) 871-8700 to learn about ways we can help with your home healthcare needs.